Despite approaching the 1000 post mark here and having blogged for several years, I still feel tickled pink whenever I read a positive review of something I've written here, or talked about on the Rubenerd Show. It's a natural high :-). I found such a beautiful (rational, intelligent, calm) response to the DBS/FOTF mess up here that I almost feel bad for freaking out at DBS the way I did. 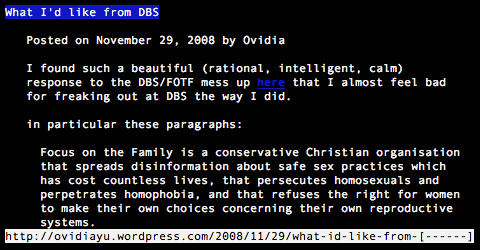 Her latest post about the DBS Focus on the Family is definitely worth looking into not only for the words above (ha!) but also because she takes a far more rational and probably more realistic view than I did in mine. As I wrote in my reply which I've posted below, I generally prefer to assume good intentions when such companies do things like this. As I said on my Google Reader profile page, I'm still young and naive enough to think there is a little good in everyone… well, almost everyone. To be serious though, I really am worried about this turn of events at DBS. When my family first moved to Singapore from Australia when I was still in primary school I got my first POSB account, and since then I’ve remained a loyal customer, even though I now live half the year in Adelaide. As you rightly say, if I had known that this was the attitude DBS wished to advertise with regards to social issues I would have jumped ship a while ago too. As a spiritual atheist coming from a family of agnostics, I just don’t feel comfortable having any of our money sent to such an organisation because as I said, they do not represent our moral values in the slightest. I try my best whenever writing complaint letters to always assume good intentions on the recipients part, perhaps even if deep down I fear they don’t have good intentions. I’m not sure whether or not this results in any more helpful responses than if I had the guts to send a more passionate message such as you did, but I guess I tend to be a soft touch when dealing with people in the real world! Here’s hoping DBS will give us a happy Yule for us non-Christians, and a happy Christmas for more moderate Christians who are upset that FOTF’s more radical views do not represent their own, by stopping their support for the FOTF organisation. I’m not holding my breath though unfortunately.